Having just returned from enjoying some lovely warm sunshine in Fuerteventura, here are some pictures I took when I was in Iceland in February. Quite a contrast. When traveling through Vik (pronounced Vig) in Iceland, you can’t fail to notice the rock stacks that extend from the cliff into the sea. These rocks are known as Reynisdrangar. The black beach at Vik can get very busy as can the beach at Reynisfjara just to the west of Vik with people wanting to view the rocks but a short drive east, just out of town and by negotiating a very rutted and decidedly icy and snowy track, I found myself on the beach with not another soul in sight. Just how I like it. This blizzard had been following us along the coast all day, it was finally making landfall and as ever, the road conditions got interesting thereafter.. This entry was posted on March 30, 2016 by Chillbrook. 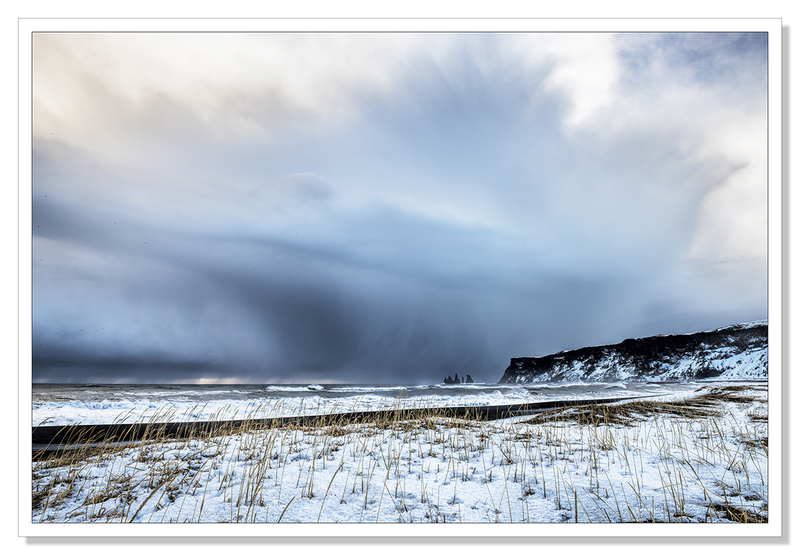 It was filed under Photography, Photography and Travel and was tagged with Adrian Theze, Beach, black beach, Blizzard, Cornwall Photographic, Iceland, Iceland in winter, Landscape Photography, Ocean, Photography, Reynisdrangar, Vik. 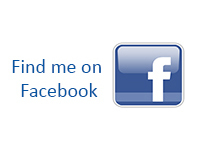 I look forward to your writing and photos. I even feel tempted to see Iceland to feel the cold winter wind and take home some great memories. Thank you very much. 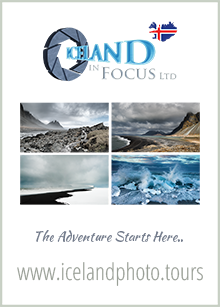 I have no doubt that if you were to visit Iceland, you would indeed take home some very good memories. I knew you were holding out! I really enjoy the one with the birds over the water. The light shining down is breathtaking. Thank you! Nothing quite like the colour of those cloudbanks that hang off the coast of Iceland! Nice images! They are incredible aren’t they? Thank you Simon! We were just in Iceland in February ourselves, what an amazing place! Nice photos, you definitely captured the feel. Stunning captures. The colors and light are fantastic. I tried one of these personal cloud storage hard drives (fancy terminology for wireless) it was useless because it took so long to transfer large photo files and doing a backup took hours and usually failed. It went back and I got two wired hard drives instead….much more stable and secure. Fortunately the cost of memory is considerably cheaper now than it was say 10 years ago. It certainly is Mark, cheaper and on the whole, more reliable. The problem with Windows is it can only handle 2GB drives so when you see a 4GB drive, you know in reality it’s 2 x 2GB in a box so no advantage. I’d really like a mini server under the stairs but that really is expensive but again, getting cheaper. Having said more reliable though, I’ve just had a wired hard drive fail, as has a friend. I’m still trying to recover what was on it. I’ve a feeling it was mainly back-ups but I can’t be sure :-/ I’ve tried everything and used all the tools I can think of but Windows is just not seeing it. I’m not terribly organised, I file by date and I seem to have the last four years covered so hopefully, it was just duplicates of files I was trying to organise in a slightly more meaningful way. Oh no…….I hope you get that sorted. So far, touch wood, I’ve not had one fail. You surely seem to enjoy solitary places where you can capture the splendour of Mother Nature in your own, special, beautiful way. These are gorgeous photos, and yes, quite different from the landscapes you captured in Fuenteventura. Thank you very much Otto! You’re so right, by seeking solitude in the landscape, I really feel at my best, most connected, and I’m sure that is reflected in the photograhs I am then able to produce. It’s not that I don’t like people, far from it. It’s just the way I like to work, by doing things this way I feel better able to distill nature in the raw and convert that into a two dimensional and yet, at the same time, multi-dimensional image. I love that group of rocks; fine set of photo’s, Adrian. Thank you very much indeed Harry! Great sense of drama in all these images. Brilliant impact and colours making me feel chilly. Success!! Thank you very much David. They made me feel quite chilly processing them! Wik is a great place to be – any time of the year. beautiful. Very dramatic photos, great effect. Magnificent shots, Adrian. 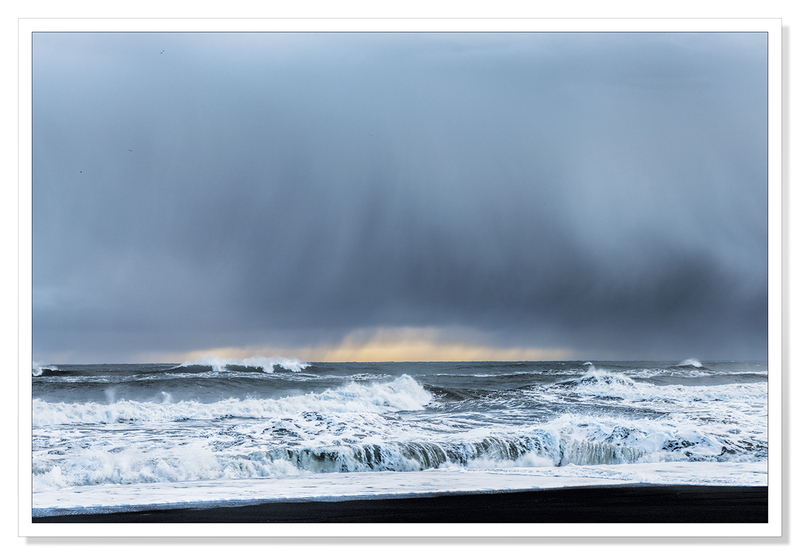 I love the black clouds, the large waves, the raining clouds… The colours are so lovely. Beautiful pictures. I love the colours! Thank you so much. When I’m processing these pictures I’ve very keen to ensure that colours remain true. These snow clouds really are this blue. It’s very beautiful! Remarkable images. In the top on the vertical stalks look like they are all leaning towards the vague blur of the sky. The third one almost looks like a movie set. That flip of waves in the 4th one could be nature can-can dance. Thank you so much Sylvia. I’m glad you enjoyed them. As I said to Poppy, it was one of those photography days. Everything was just perfect for some very dramatic photographs. Impressive! 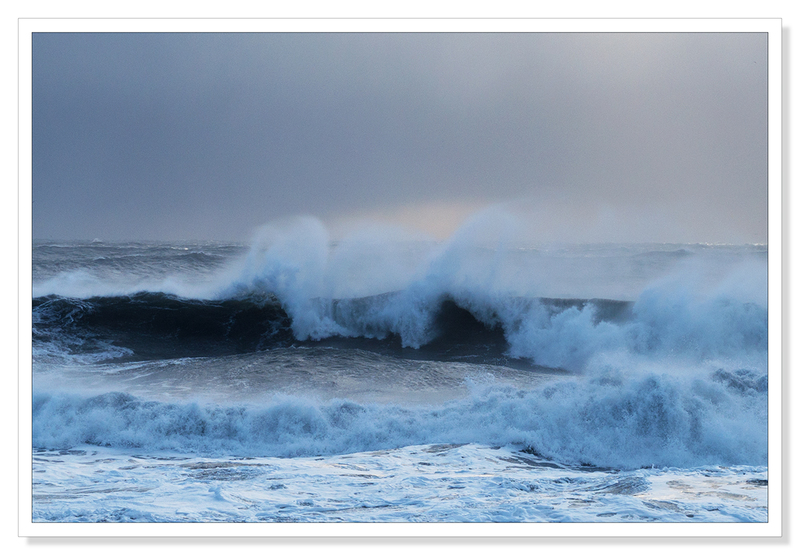 And the idea of waves creeping up, yes… they always do that! Aah, more memories Adrian! Those skies are magnificent, the first one is like a watercolour. Wonderful photos, thank you! No one can make the cold look as beautiful as you! You also talk so casually about bad weather rolling in – do you have a driver familiar with local conditions? Utterly gorgeous shots, but they do give me the shivers. The Stacks at the end of the headland are extraordinary – they remind me of the Buttes in Monument Valley in a strange way. 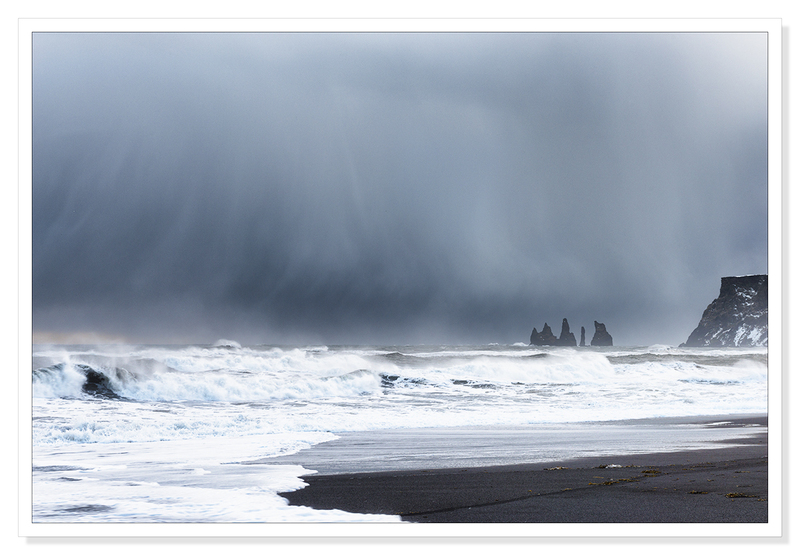 Spectacular seascapes, and I love the contrast of the sow against the dark volcanic sand. Another stunning place in dramatic weather. 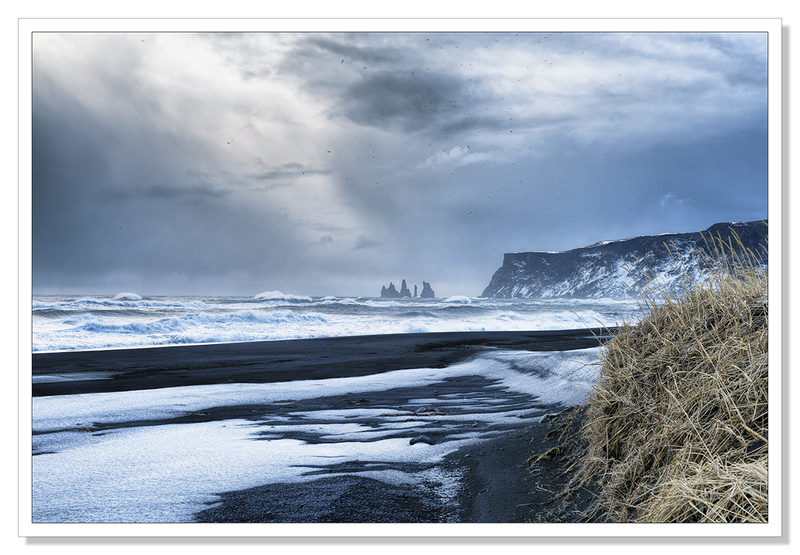 Thank you Andy, the black sand certainly gives the scene a very dramatic edge and with the contrast against snow, you can’t help but create an interesting image. So much drama! Those black sand beaches really make for some fantastic contrasts. Those skies are something else :-) I can practically feel the storm whipped up around me! These are just gorgeous – those skies – I love the watery power in them. I am a sucker for storms and the coast, so when you put the two together something magical is bound to happen, and this is exactly what you have captured. A bit chilly and miserable weatherwise to be out shooting, but I am guessing with camera in hand, you felt there was nowhere better to be! You’ve defined the passion of photography with this comment Adrian ~ simply perfect. Best part “in super sub-zero temperatures, I’ve had to be reminded I’m out of the car and don’t have a coat on” And then take a look at your images, and this is the result of your passion. Wonderful work you do produce! wow, this is incredibly beautiful . These are wonderful – they capture the storm beautifully. ‘Bad’ weather is always worth the effort but getting wet at -10ºC doesn’t sound like fun!! Definitely a wet cold experience for you, Adrian, shiver. And what a treat for us. Love the dramatic touch to the scene, beautiful work.